Retired Command Sergeant Major Edward H. Lugo, died March 15, 2004, at Walter Reed Army Medical Center in Washington, D.C., following a brief illness. 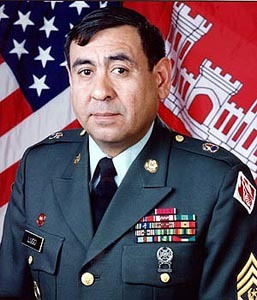 Lugo, a veteran of more than 30 years of service, served as the sixth Command Sergeant Major of the U.S. Army Corps of Engineers from July 1997 until his retirement in March 2001. As the USACE Command Sergeant Major, Lugo served as the Chief of Engineers' personal advisor on day-to-day operations, which included enlisted and wage grade matters, and Soldier and civilian quality of life. As the Command Sergeant Major, Lugo sat on a variety of councils and boards, which made decisions that influence soldiers, families, the Corps of Engineers, and the Army. "I consider myself very fortunate to have known and served with Command Sergeant Major Eddie Lugo," said Lieutenant General Robert Flowers, Chief of Engineers. "He was an outstanding Soldier, committed leader, and close friend who left a significant positive impact on the Engineer Regiment. Eddie was a leader who 'walked the walk,' and I'm confident his legacy will continue on in the many Soldiers, family members, and leaders he has mentored, advised, and served with." During his long career, Lugo received numerous awards and decorations including the Kuwait Liberation Medal for having served in Southeast Asia, Kuwait, and Saudi Arabia during the first Gulf War. "Eddie will be remembered for his unwavering commitment to Soldiers and their families," said Lieutenant General (retired) Joe Ballard, 49th Chief of Engineers who commanded USACE during Lugo's tenure. "He was kind, professional, and a very dear friend. He was loyal, dedicated, and had an overwhelming commitment to Soldiers." "It was senior NCO leadership like Lugo's which rebuilt the Noncommissioned Officer Corps step-by-step in the '70s, and then by leaps and bounds in the '80s," said Command Sergeant Major Mike Balch, current USACE Command Sergeant Major. "The Corps of Engineers and the Army has lost a legend...a member of the engineer family, a friend, a great Soldier. He was leader, coach, and mentor to many of us. We stand on the shoulders of giants that came before us, and Command Sergeant Major Ed Lugo was one of those giants in our Army." Lugo's funeral was held April 6, 2004, in the Old Chapel at Fort Myer, Virginia. He is buried in Arlington National Cemetery, across the Potomac River from Washington, D.C. He is survived by his wife Marita, son Andre, his mother and stepfather, four stepbrothers, one sister, and 12 grandchildren. NOTE: E-mail of May 2011: I am the former spouse of CSM Edward H. Lugo, who did not serve in the Viet Nam War but was stationed in the Federal Republic of Germany. CSM Lugo was a drill sergeant at the former Fort Ord, CA where in the year of 1973 I was honored to be a part of such a great soldier. In September of 1974 we were married in Salinas, CA. CSM Lugo’s record should reflect his dedicated service at Larsen Barracks, Kitzingen, FRG.